I have always loved penguins, but the more I learned about them, the more I realized how interesting they are from how they can act like a dog when petted, be identified, and what we can all do in our daily lives to help save theirs! Did you know that most penguins, including these live in warm climates? Watch the video and learn from the Jason, the biologist who cares for them, what adaptations help them do so! As a grabbed my cat out of the woods, I couldn’t imagine why this little bird sat only feet away within arms reach. 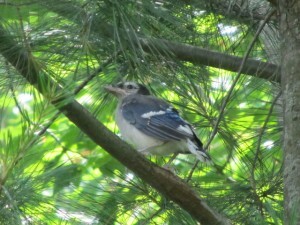 Then it dawned on me, this is only a fledging, or a young blue jay developing into an adult. I put the cat in, got my camera, and luckily I found the fledging again. It could only make short fights from branch to branch. 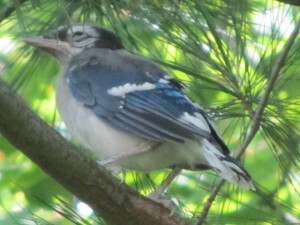 Blue jays leave the nest when they are anywhere from 17 to 21 days old. One of the parents kept a careful eye on me and squawked if I got too close. The family will hang together all summer as the fledgling reaches adulthood. Blue jays not only use the voices to communicate but will also raise the crests on the top of their heads when they feel danger is present. They also are able to mimic the sounds of certain hawks, cats, and humans. Until this little fledgling can fly really well my cats will be staying inside! Help Scientists Learn More About Birds! Turn your backyard into a bird observation area that is part of a worldwide network by adding your bird sightings to eBird. eBird is a worldwide database about birds!!! People all over the planet are recording the different types of birds, how many they see, and the date and time that they spotted the bird in their backyards. By adding your observations you will have your own eBird page which will be a record of what is going on in your backyard. The site says you can add birds that you see on vacation as well. Think about it… a lifetime record of all the birds you ever met! Very cool! This information helps scientists and conservationist learn more about birds and our environment! You can use allaboutbirds.org to help you identify the birds you see. 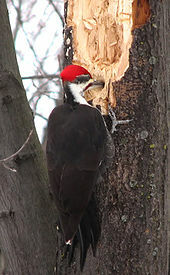 I once saw a pileated woodpecker in my backyard, which is a very large bird that to me sounds like a chicken. I honestly thought someone’s chicken had gotten loose was roaming the woods until I got my binoculars out and found the noisy bird pecking in a tree. I haven’t see it since, but if I do, I will let you know on eBird! I will log (submit to eBird) the sighting of the six wild turkeys that came though my yard at dusk yesterday. You just never know what feather friend might show up! In the beginning of the month of February, I was looking out the window having my morning cup of coffee and this very large bird landed in the woods near my home! At first I could not tell what type of bird it was and then it few away revealing its idenity. 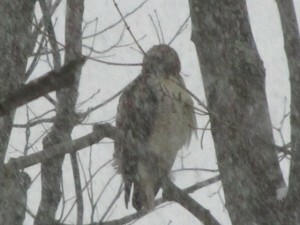 It was a red-tailed hawk. 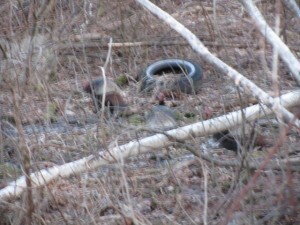 Although far away, you can see the red on the tip of its tail feathers. It is one of the largest birds in North America but only weighs around 3 pounds. A dog of the same size would weigh around 30 pounds. According to the Cornell Lab of Ornithology hawks prefer to sit by open fields and it was rare that it came into this area. 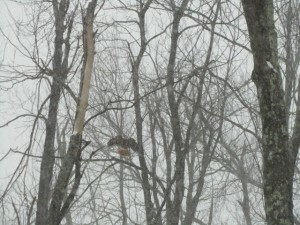 Red-tailed hawks do nest in tree tops. Nests can be as tall as 6 feet and as wide as 3 feet. If you were to measure from the tip of one extended wing to the other that is called the wingspan. 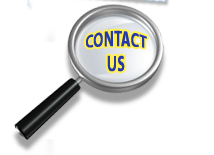 The wingspan can be from 3.5 to 4.5 feet across. These big wings help the hawk fly at speeds around 40 miles per hour! Learn more and hear their sound by visiting www.allaboutbirds.org!